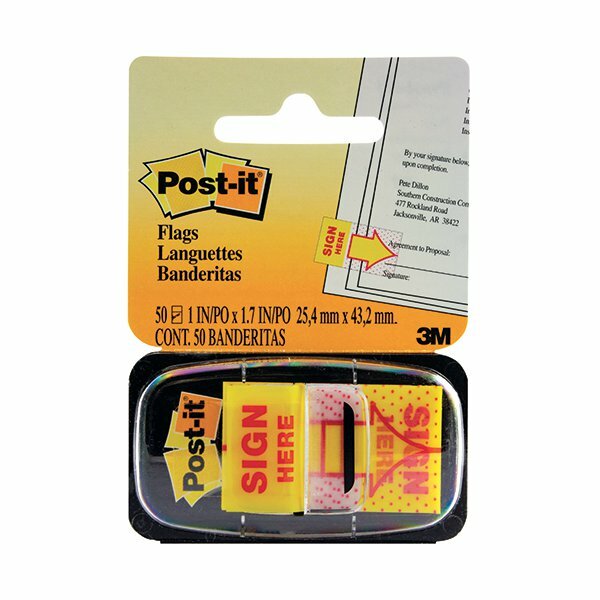 Post-it Index Printed Flags are repositionable flags that let you draw attention on a page without underlining, circling or damaging the original document. 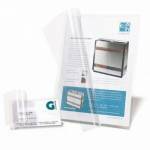 Choose Post-it Sign Here Flags to mark a page and pinpoint exactly where to sign: each flag is pre-printed with an eye-catching 'Sign Here' symbol that saves you time whilst ensuring that your document is completed accurately, even when you are not there in person to advise. With Post-it Sign Here Flags your colleagues, clients, customers and contacts will never omit a critical signature again! Simply stick the self-adhesive, removable and repositionable flags next to the sections of your document that require a signature. When you want to remove them or switch them around, just peel and re-stick. 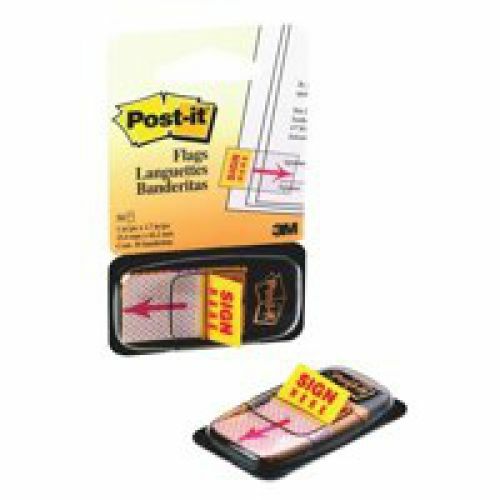 The tried-and-tested Post-it adhesive holds well, but the flags remove cleanly without damaging the paper underneath or leaving a sticky residue. The result is a clean and accurate, professional-looking document - signed in the right place, first time around! 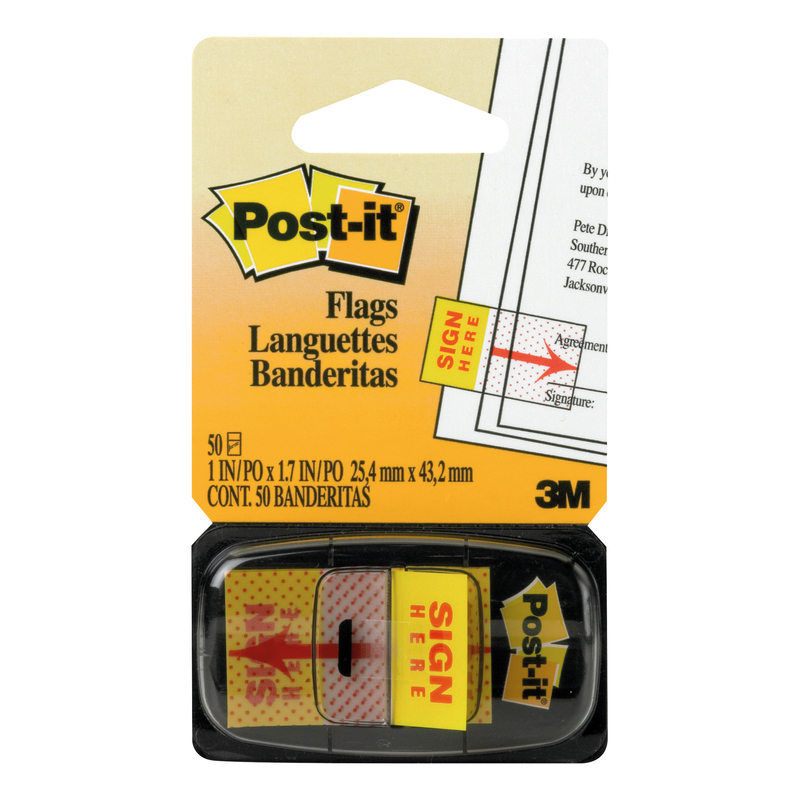 This value pack contains 200 flags measuring 25mm x 43.2mm, pre-printed with a 'Sign Here' symbol. The flags are loaded into a handy Desk Grip Dispenser so your supply is always close to hand. The unique, adhesive-free design of this dispenser grips to any desktop surface to make it easy to grab a flag with one hand. It is lightweight enough to go where ever you need to work, and contains four times more flags than a standard dispenser so you'll run out less often. Can be used to refill any Post-it? Index dispenser. Post-it Signature Index are pre-printed tabs with a hand signature symbol to direct attention right where you want it - on the dotted line.